Schultz said that he asked her if she would have called the police on the two men if they were white. He claimed the manager responded by saying, "Probably not." Former Starbucks CEO and possible presidential candidate Howard Schultz made a bombshell claim about the manager involved in last year's arrest of two black men at a Center City shop. Schultz said that he asked her if she would have called the police on the two men if they were white. He claimed the manager responded by saying, "Probably not." Howard Schultz made a bombshell claim about the manager involved in last year's arrest of two black men at a Center City Starbucks. The former Starbucks CEO claimed the manager told him she would "probably not" call the police if the two men were white. Schultz made the statement after a woman who witnessed the incident accused him of not describing the incident accurately. 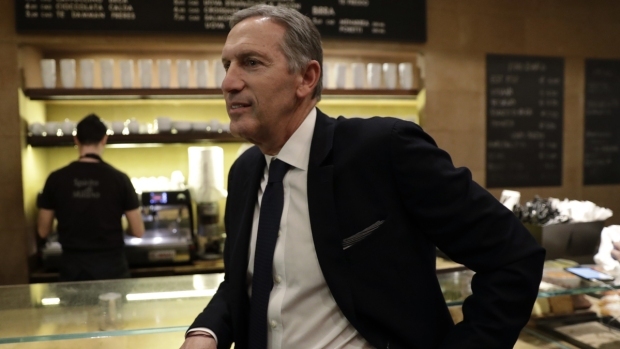 Former Starbucks CEO and possible 2020 candidate Howard Schultz claimed the manager of one of the company's Philadelphia's shops where two black men were arrested last year might not have called authorities if the two men had been white. He made the comment during a stop on his book tour at the Parkway Central Library Wednesday night. “I spent time with the manager one-on-one and I just asked her a simple question,” Schultz said. “I asked her if those two young men were white, would she have called the police? And to her credit, she said, ‘Probably not.’"
The manager's answer indicated that she had racially profiled the two men, he added. Former Starbucks CEO and possible presidential candidate Howard Schultz made a bombshell claim against the manager involved in last year's controversial arrest at a Philadelphia coffee shop. Schultz claims that when asked whether she would have called the police on the two men if they were white, she responded by saying, "probably not." "Once I knew what she said, I felt I had a moral obligation to tell the truth,” Schultz said. Rashon Nelson and Donte Robinson, both 23 years old at the time, were arrested in April 2018 while sitting at a Rittenhouse Starbucks waiting for a business meeting. Video of their arrests went viral, prompting outrage and accusations of racism against both the coffee chain and Philadelphia police. Schultz, who was the executive chairman of Starbucks at the time, personally apologized to the men. The company also changed store policies and closed 8,000 shops across the country one afternoon for bias training. As Schultz described the incident and subsequent fallout, Melissa DePino, who first posted the video of Nelson and Robinson being handcuffed and led out of the store by police, stood up and challenged Schultz's version of events. "You are not describing the incident accurately and the way you are describing it is perpetuating the problem," she said. "And I know you want to be part of the solution and I hope you will be, but when you say there were words between the [men and the manager], and she felt threatened, that didn't happen. I saw it with my own two eyes. I was there." Schultz responded to DePino, acknowledging that he didn’t actually witness the encounter. He also said that he had "great respect" for what she saw and described how he handled the situation after having a private conversation with the manager. DePino told NBC10 after the event that she had a mixed reaction to Schultz’s response. Nelson and Robinson settled with the city in May 2018 for a symbolic $1 each and a promise from officials to set up a program for young entrepreneurs. CORRECTION (Feb. 14, 2018 11:11 a.m.): Howard Schultz was the executive chairman of Starbucks at the time of the arrests.